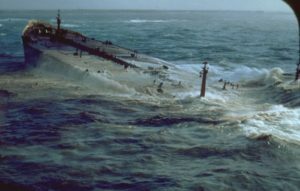 On March16, 1978, an oil tanker—the Amoco Cadiz—broke apart in heavy seas just offshore of Brittany, France. The event captured the world’s attention and quickly became, and remains, one of the most famous oil spills in modern history. The Amoco Cadiz was a new ship, only three years old. It was large, measuring over one thousand feet long and carrying 67 million gallons of oil. It was owned by an American company, but registered in Liberia. On this day, the Amoco Cadiz was enroute from the Persian Gulf to Rotterdam, The Netherlands. It entered the English Channel on the morning of March 16. Sea conditions were dreadful, a force-10 gale blowing up heavy seas. A large wave hit the ship and the steering mechanism failed. Now floating without control, the ship was blown closer to the French shore. The crew sent for help, and tug boats arrived to pull the ship to safety. However, several tow lines from the tug to the ship snapped in the heavy seas. By late that evening, a tow line was secured, but the ship had drifted dangerously close to shore by that time. It hit rocks in shallow water, and the engine room flooded. Soon, it hit the rocks again, tearing the ship into pieces. By early the next morning, the tanker’s cargo of 67 million gallons of light crude oil had emptied into the ocean, along with thousands of gallons of the ship’s own fuel supply. Heavy seas continued for several days, continuing the destruction of the ship. It was declared a total loss and later the French navy destroyed the remnants of the ship with explosives. The accident happened a few miles off the French coast, and the high seas prevented efforts to contain the 12-mile oil slick that developed. 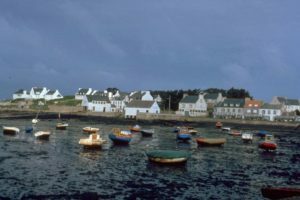 Scientists estimated that about one-third of the oil eventually reached shore, coating approximately 45 miles of the French coastline. A force of 7000 French soldiers spent months combing the shoreline removing the oil, mostly by hand. Scientists concluded that the Amoco Cadiz spill had produced the largest biological kill of any spill in history. Twenty thousand dead birds were recovered (more than twice as many as were recovered from the Deepwater Horizon spill), mostly marine diving birds. Millions of marine invertebrates—mollusks, sea urchins and others—continued to wash ashore for weeks. Oyster farms in the area had to destroy 9,000 tons of oysters because of contamination. The fishing and tourism industries, of course, were negatively affected. Clean-up activities themselves caused considerable damage. Trampling of vegetation and soft sediments by workers disrupted biological processes in wetlands. Salt marshes took many years to recover. The Amoco Cadiz spill was studied extensively, the first such spill to receive such attention, and protocols for future recovery efforts were based on the results of those studies. The owner of the ship eventually paid more than $100 million to the French government in penalties. Although the size of this spill has been surpassed since then (it is the fifth largest oil-tanker spill in history), it remains the poster-image for the consequences of marine transportation of oil. Gillis, Carly. 2011. Amoco Cadiz: A Brief History. Counterspill, April 10, 2011. Available at: http://www.counterspill.org/article/amoco-cadiz-brief-history. Accessed March 14, 2018. ITOPF. Amoco Cadiz, France, 1978. Available at: http://www.itopf.com/in-action/case-studies/case-study/amoco-cadiz-france-1978/. Accessed March 14, 2018. Mehnazd. 2016. The Gruesome Amoco Cadiz Oil Spill Incident. Marine Insight, July 18, 2016. Available at: https://www.marineinsight.com/case-studies/the-gruesome-amoco-cadiz-oil-spill-incident/. Accessed March 14, 2018. Shpiwreck Log. Amoco Cadiz. Available at: https://www.shipwrecklog.com/log/history/amoco-cadiz/. Accessed March 14, 2018.